Etienne is a Certified Professional Member of the Tarot Guild of Australia, the peak body of Tarot in Australia. His Hypnotherapy Qualifications are nationally recognised and accredited. He is also a Full Member of the International Institute for Complementary Therapists. Etienne studied the Tarot under Tarot Master and Mage Monsieur Montet of Alexandria, Egypt. He has also studied with Tarot Grand Master Rachel Pollack. He also studied Palmistry under Lahiri Lalit Jivanmuktaji in Northern India. This experience lead him to practice Palm and Tarot Readings and Hypnotherapy professionally in Australia, Northern India, Malaysia, Singapore, UK, Ireland, France, Italy, Central and Eastern Europe, Greece, Turkey, and Vietnam. Etienne's Palm Readings are based on Hindu Hast Rekhya and Samudrika Hastya traditions. 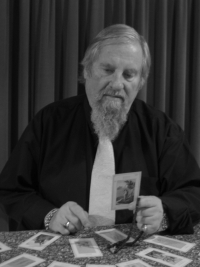 His Tarot Readings are undertaken in the Grand Etteilla and Golden Dawn traditions. The Golden Dawn was an English secret Hermetical Society founded in 1888.